Percona Server 5.1.51-rel11.5 is now based on MySQL 5.1.51. The Release Notes for this and previous releases can be found in our Wiki. For general questions, use our Pecona-discussions group, and for development questions our Percona-dev group. MySQL is a single process with multiple threads. Not all databases are architected this way; some have multiple processes that communicate through shared memory or other means. It’s cheap to create a connection to MySQL, because it just requires creating a thread (or taking one from a cache). This is generally so fast that there isn’t really the need for connection pools as there is with other databases, at least not in the same way. Windows in particular has had excellent threading support practically forever; Linux has very good threading now, but that wasn’t always the case. However, many development environments and programming languages really want a connection pool. They’re just built that way (I’m looking at you, Java). And many others use persistent connections by default, so that a connection isn’t really closed when it’s closed; it’s kind of like a connection pool, except that the connection is persisted from request to request within the same process, rather than being shared with whichever request needs a connection. Connection pools and persistent connections combined with a large number of application servers can lead to a situation where the database server has a very large number of connections open to it, most of which are doing nothing. It’s not uncommon for me to see a server with 1000 to 5000 connections open, and maybe one to three are actually running queries on average. These connections originate from dozens to hundreds of application server instances. When you have a heavily sharded or otherwise horizontally scaled application, it’s not only easy to get into this pickle, it’s really hard or impossible to avoid it. And with 5000 connections open, you get 5000 threads in the server. That increases the overhead from thread scheduling, and potentially memory usage as well. I feel like I’m forgetting some reasons that this matters — please fill in whatever’s missing in the comments. There can be more than one solution to this problem, but the one that’s actually partially implemented is a pool of threads, which was originally coded for MySQL 6.0, but is available now in MariaDB. Unfortunately it isn’t a full solution, because it can cause undesirable lock-out or waiting, and the specific implementation has a scalability bottleneck on multicore servers. Mark Callaghan has done much more investigation of the pool of threads than I have. There are more details in this blog post by Mark, and two followup blog posts from Tim Cook (1, 2). Thanks for the great comments on the last post. Some of them were good guesses. Remember that the context for this series isn’t micro-limitations or edge-case badness (even if they are serious in some cases), but rather a focus on shortcomings in the main use cases for the server. There are a lot of things MySQL doesn’t do well, but it doesn’t matter that much, because that’s not what it’s designed for. Wrong tool, wrong use, NotABug. I’m thinking of the lack of sort-merge joins or intra-query parallelism, for example. It would be lovely to have those things, if you’re running a data warehouse on MySQL, and in some cases for other uses too (note that most databases that do have these query plans usually try to use nested-loop joins whenever possible, because of things like the lower startup cost for the query). But MySQL isn’t a data warehouse DBMS first and foremost. It’s a general-purpose OLTP database server that runs well on affordable hardware and is great for Web usage. It’s so good, in fact, that it can be used for tons of other things such as… data warehousing. But it isn’t a Netezza or Paraccel, and if it were, it wouldn’t be a great OLTP web database too. MySQL replication is one of the core, fundamental features — and it’s single-threaded and relies on the binary log, which are two major limitations. And it has subqueries, which are a core, fundamental part of SQL — but it’s bad at certain kinds of them. That’s why I listed those as major limitations. And because MySQL is a multi-threaded database for Web usage that tends to be used in sharded environments with tons of application servers, which creates a situation with many thousands of connections to the database, and because it doesn’t handle that very well, I list its one-thread-per-connection design as a serious limitation. What is the conclusion? With the exception of my original option2, they actually all perform fairly similar. The Flickr and Option1 tests perform marginally better. Test “arjen2″ is option2, but with a MyISAM table — it suffers a little because EC2 can be a little high for latency, and there’s one additional round trip. Test arjen2005 is not too dissimilar from the Flickr solution, but uses a MySQL stored function. This is the third in a series on what’s seriously limiting MySQL in certain circumstances (links: part 1, 2). This post is about subqueries, which in some cases execute outside-in instead of inside-out as users expect. The fix for this has been in progress for a few years, and Sergey Petrunia committed working code to the stalled 6.0 release. But it’s not quite clear whether that code was a complete solution. It has not been in any GA or RC release, so it hasn’t been used widely. To be fair, many other database servers also have poor subquery performance, or have had it in the past and have fixed it. And many MySQL users have learned to simply write JOINs instead, so it isn’t that much of a limitation. But it would be a big improvement if it were fixed. See if you can guess what limitation number 4 will be! which in addition to output the total time, output the number of Sort_merge_passes, which will be useful to interpret the results. The figure below shows a graphical representation of the results. The first we can notice by looking at the graph is that the expected correspondence between the time for the queries and the number of sort merge passes. For the small values of the sort buffer size, below 440KB, there are many sort merge passes and the time for the queries hover around 18s. Above 440K, as the sort merge passes drops to 1, there is a large drop of the time for the queries below 14s. 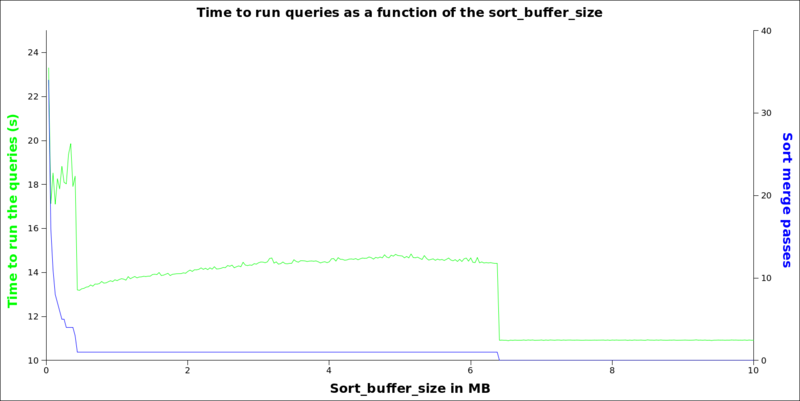 Then, as the sort buffer size is further risen, the performance gain is negative up to the point, around 6.4MB where no more sort merge pass are required and then, the time for the queries loses all dependency over the sort buffer size. I am still trying to figure out why the number of sort merge passes felt to zero at 6.4MB since the total size of the table is less than 3MB. That seems to be a pretty high overhead per row (~37 bytes) but if the structure has a few pointers, that can add up to such amount of bytes pretty quickly. The important point here, at least for the Linux, glibc and MySQL versions I used and for the test I did, there doesn’t seem to be an observable negative impact of the glibc memory allocation threshold at 256KB. I’ll try to find ways to repeat this little experiment with the other per session buffers just to confirm the findings. P.S. : Gnumerics for graphs is so much better than OpenOffice Calc. This is the second in a series on what’s seriously limiting MySQL in certain circumstances (links: part 1). In the first part, I wrote about single-threaded replication. Upstream from the replicas is the primary, which enables replication by writing a so-called “binary log” of events that modify data in the server. The binary log is a real limitation in MySQL. The binary log is necessary not only for replication, but for point-in-time recovery, too. Given a backup and the corresponding binary log position, you can replay the binary log and roll forward the state of your server to a desired point in time. But enabling the binary log reduces MySQL’s performance dramatically. It is not the logging itself that’s the problem — writing the log is usually not much additional work. It’s ensuring consistency and durability that is expensive. Flushing it to disk adds an fsync call for every transaction. And the server performs an XA transaction between InnoDB and the binary log. This adds more fsync calls, and causes mutex contention, and prevents group commit, and probably other things that aren’t coming to mind now. The performance reduction can be an order of magnitude or more. What’s the solution? I’m not sure I can summarize it concisely. There is a lot of complexity, and honestly I don’t understand some of the server internals fully enough to have a 50-thousand-foot view of it all. The binary logging and replication code, and its interaction with InnoDB, is difficult to understand. Kristian Nielsen has an extensive series of posts on group commit alone. I think that a full fix might require significant architectural changes to MySQL. This will be hard. Maybe Drizzle is going in a good direction — time will tell. All of the solutions that I can think of are too simplistic. For example, doing replication through the InnoDB transaction log would work fine if a) all the data were in InnoDB, and b) InnoDB’s data didn’t have to be synchronized with the .frm files (and Drizzle has gotten rid of the .frm files, hooray), and c) privileges and other changes to the non-InnoDB data in MySQL were handled manually. It could work if you just made sure that you didn’t change privileges or schema, but that’s a description of a pretty limited, clunky replication system from the user’s point of view. Still, I have considered it. There would need to be a mechanism of transporting the log files, and InnoDB would have to be put into a state of constant “recovery,” and it would have to be modified to be available read-only in this state so that it could be used for read queries. This can be done, of course. It’s just a matter of how hard it is. It’s worth noting that PBXT does replication through its transaction logs, so there’s even precedent for this among MySQL storage engines. And there is Galera’s multi-master synchronization technology to look at, too. From the previous posts of this series, we now have an instance restart script that can restart the database node in case of failure and automatically reconfigure Pacemaker and the other servers that needs to access the MySQL server. What we will cover in this post is the monitoring script that run on the MySQL node. Although fully functional, this monitoring script is rather weak could be not working and the cluster would unaware of it. Very complex monitoring scripts can be written but let’s provide a basic functional one that monitor MySQL with the mysqladmin ping command. For the ones that knows Pacemaker a bit, they could wonder why I didn’t use crm_resource to migrate the MySQL resource to the other node. The problem with this approach is that the migration with crm_resource is achieved by setting the host affinity for the resource to INFINITY for the Monitor node. When the resource is moved, the MySQL node is restarted and its local copy of the cluster configuration is lost. After restart, the copy of the cluster configuration on the Monitor node will be pulled back by the MySQL node and since this copy has INFINITY as affinity of the resource to stay on the monitor host, the resource will stay there. If the resource is not move away quickly (within 5 min) from the Monitor node after the restart of the MySQL node, the instance restart script on the Monitor node will loop and restart again the MySQL node. Stopping the heartbeat service achieve the desired result without polluting the cluster configuration. The following post in this series will add some details as how the IP of the MySQL server is broadcast to the client nodes. I thought I’d write a few notes that didn’t seem appropriate to include in the case study, because this was a fun project that might be interesting to readers. As usual, it was all about diagnosing the problem correctly. I used a variety of tools to help with this, foremost among them “stalk” and “collect” from Aspersa. There were several problems, not just one, and they required different techniques to diagnose. This can be hard when the problems are happening sporadically and/or mixed together. You really need to be disciplined and collect data, data, data. If you are not sure about the cause of something, you don’t have the right data. Maybe you have too little, or too much, or you have the signal mixed in with the noise. Knowing when and how to get and interpret good diagnostic data is easily 95% or 98% of the work in a case like this. All I had to do was wait until the problem happened, look at the diagnostics, and a couple minutes later I had my answer. What were the problems? The query cache was causing both mutex contention and excessive CPU usage, for different reasons, and I found different problems in different samples. InnoDB was also dying under mutex contention. Each spike of slow queries I found was caused by different things. Sometimes GDB stack traces showed InnoDB mutex contention, sometimes oprofile showed the query cache hogging the CPU, and so on. So we had to solve all the problems, not just some of them. 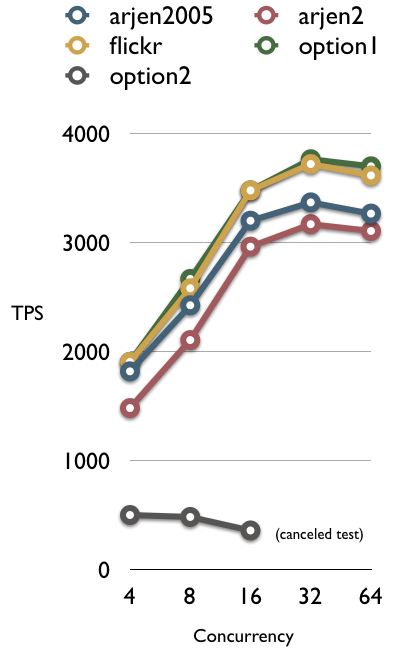 The graphs of query traffic and response times were from data I gathered with tcprstat. I also used the data from tcprstat to analyze the variation in query response time. One-second intervals is a relatively fine granularity, but at that level you can see better when micro-freezes are occurring. I used ad-hoc slow-query-log analysis with awk and other tools to discover and investigate unusual patterns, and figure out whether queries were causes or victims of performance problems. The problems here were not caused by queries, but query behavior was the symptom that we could observe, so all of the above analysis was useful for detecting the problem as it happened, and verifying that it was not still happening after we implemented fixes. New Relic was a very helpful tool in this case, too. If you don’t use New Relic, you might try it. (We don’t get paid to say that.) Their tools are really nice. I also want to mention that this database’s problems were entirely inside the database software itself. The ideeli team had already done a great job with indexing, query optimization, and so forth. Nothing more could be done without fixing these problems inside MySQL and InnoDB at the source code level, or changing the application architecture. All things considered, the database server’s performance is not as high as many I’ve worked on, so the absolute numbers of queries per second may not look impressive. However, remember that this database is running on an EC2 server. EC2 has relatively slow virtual CPUs, and given that and the workload this server is under, it does very well. Of course you could far exceed that performance on a “real” server. This case illustrates why average-case performance isn’t a good metric. As Peter says, “the average temperature of patients in the hospital isn’t important.” Good performance means avoiding outliers and variations. The query performance needs to be a) fast, and b) fast all the time, and c) the same kind of fast all the time. Variations in performance at one layer introduce cascading variations at each higher layer. Rarely is a stuttering component’s misbehavior absorbed by other layers. Instead, every layer above it gets into trouble. That, among other things, is why the database has a much harder job than people sometimes realize, and why it’s so hard to write a good database server.